This November, the Teenage Mutant Ninja Turtles and the Ghostbusters reunite for an inter-dimensional comic book adventure (and probably a large pizza!) in the upcoming weekly crossover event series from IDW Publishing. The new story begins when an old adversary traps the Turtles in a ghost dimension, as old adversaries are wont to do. However, all hope is not lost for our Heroes in Half-Shell, as New York City's resident experts on all things spooky quickly answer the call. Here's what co-writer Erik Burnham had to say in a statement. "I had such a blast working on the first crossover with Tom, and in the years since, we've talked about what we might do if we ever got a crack at a sequel. When the opportunity came up, we didn't even use a single one of those plans! Instead, we grabbed villains from both universes and mixed them together to form the foundation of a fun story that furthers the ongoing stories of both the Turtles and the Ghostbusters. Even better, we get some more one-on-one scenes, allowing their complementary personalities to shine and we're beyond excited to share!" The dream writing team of Erik Burnham (Ghostbusters, Teenage Mutant Ninja Turtles Universe) and Tom Waltz (Teenage Mutant Ninja Turtles, editor for Ghostbusters) are back to tackle scripting duties and will be joined by lead Ghostbusters artist Dan Schoening, whose animated art style has come to define the look of the Ghostbusters comics. An array of multi-talented artists with Turtles credentials are also getting in on the mass hysteria including Pablo Tunica (Teenage Mutant Ninja Turtles Universe), Tadd Galusha (TMNT: Bebop & Rocksteady Destroy Everything), Mark Torres (Teenage Mutant Ninja Turtles), and C.P. Wilson III (Teenage Mutant Ninja Turtles/Ghostbusters). Here's what co-writer Tom Waltz had to say in a statement. "When Erik and I first broached the idea of joining the TMNT with the Ghostbusters way back when, it felt like a wonderfully impossible dream. Well, that dream came true with the first volume in a big way, and now I'm absolutely ecstatic to have the opportunity to once again help bring my two favorite quartets together for another massive comic book crossover event! And, like the first go-around, the events in this story directly flow out of and affect the storylines in both ongoing series." When last the Turtles and the original 'Busters crossed streams with IDW Publishing in 2014, the Turtles got stuck in the Ghostbusters dimension... along with a brand-new, all-powerful, all-crazy ghost from centuries past! It was met with enthusiasm from both fans and critics with IGN declaring the mash-up of proton packs and ninjutsu "hugely entertaining." Teenage Mutant Ninja Turtles/Ghostbusters 2 #1 hits stores Wednesday, November 1, 2017. Let the ectoplasm fly, dude! 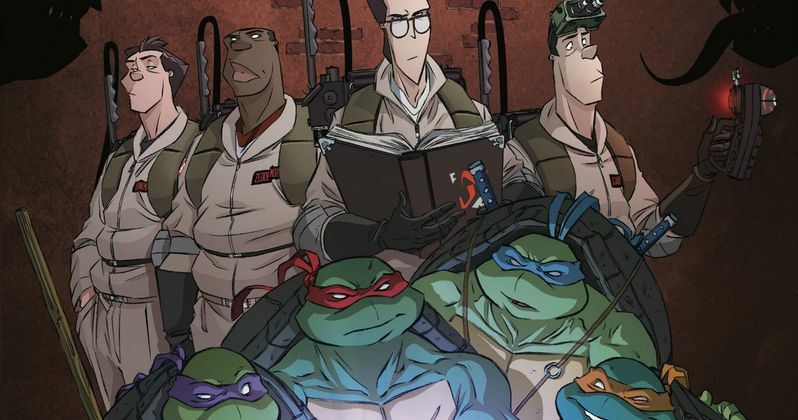 Take a look at the cover art for the first issue of this Teenage Mutant Ninja Turtles and Ghostbusters crossover below.